Several significant upgrades have been made to the course over the years, resulting in an exceptionally attractive and enjoyable course. 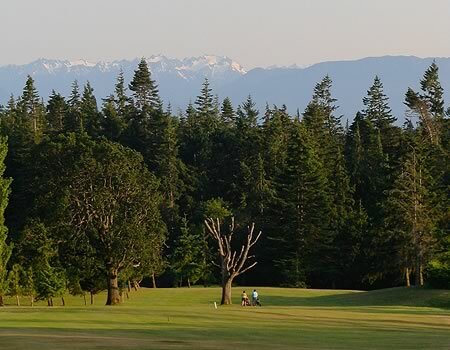 Metchosin GC has that rare quality of being challenging for the avid golfer yet forgiving for the inexperienced golfer. The course makes you test each of your clubs through wide fairways and undulating greens. The clubhouse offers a great casual setting to cater your banquet, special event, or golf tournament, and is only a 25 minute drive from downtown beautiful Victoria! The bar is open 7 days a week and the grill is open Wednesdays and Thursdays for a Nine and Dine special any time after 2:00. Every 3rd Friday of the month is Music Night featuring a local band. Bar and kitchen open at 5:30, $5 donation goes to musicians. SIDGS (South Island Disc Golf Society) has built an 18 hole disc golf course on the property. The disc golfers will not be interfering with the flow of regular golfers, as the disc golf course closely follows the same route as the regular golf course. Join us any day of the week after 12:30 and play 18 holes of disc golf.